With the Stanley Cup Finals underway and a potential for four new Russians to be immortalized, we here at FRWG decided to take a look back to see how the comrades of yesteryear ranked amongst one another. Criteria included a minimum of 500 NHL games, at least one cup, stats of the non fancy variety, and a whole lot of eternal struggle. Note this list is not set in stone and a will likely look very different following the conclusion of the careers of today’s Russian stars. When Alexei Kovalev isn’t making millions of dollars or creating commercials or flying in his private jet, he certainly isn’t living up to his price tag at the NHL level. Granted, the Ottawa Senators have been in a downward spiral since the season began and are now putting up a fire sale making way for their prospects to get their feet wet in the NHL. Alexei Kovalev was the latest victim to Ottawa’s massive overhaul. After signing a two-year, 10 million dollar contract, Kovalev has put up 76 points in 131 games for the Senators. Compare this to a few seasons ago when he was a point-per-game player with the Montreal Canadiens and it is safe to say that Kovalev has been on a steady decline. For the first time in our short history we have two comrades of the night as two of Russia’s most seasoned NHL vets had a memorable night up in Ottawa. Prior to face-off, the Senators honored Sergei Gonchar on his 1,000th game in the NHL by presenting him with a plaque, a silver stick, and a portrait. A video was also shown of his career and the various teams he played for including Washington, Boston, and Pittsburgh respectively. Gonchar becomes just the fifth Russian (and third Sergei) in league history to surpass the plateau joining the likes of Sergei Fedorov, Alexei Zhitnik, Slava Kozlov, Sergei Zubov, and teammate Alex Kovalev. 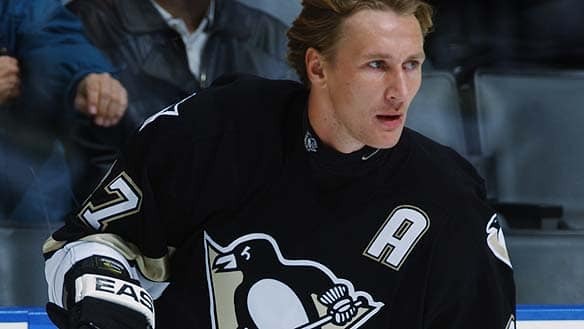 Kovalev will soon surpass Fedorov for most all-time games for a Russian-born NHLer needing just 11 more games. After being criticized in the early going of the season by GM Bryan Murray, Kovalev scored two goals and added an assist en-route to a 5-2 Ottawa win.